One of my biggest struggles with endometriosis is finding foods and recipes that are 'Endo-Friendly'. Foods that will not agitate my endometriosis, IBD, or generally sensitive digestive system (refer to basic guidelines here). I'm trying to share my recipes here. In the beginning, there will only be a few. In time, the recipe list will grow. If you would like me to add a recipe or ready-to-eat food of your own, feel free to email me at bedriddenhead@gmail.com. Sorry for the less than stellar photographs! Nachos! 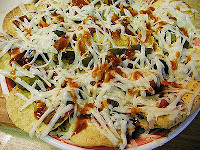 I am a huge sucker for nachos. They're easy, delicious, and you can make them as healthy/unhealthy and fancy/plain as you like. They are naturally gluten free, are easy to make vegetarian, and you can even substitute non-dairy cheese if dairy makes your symptoms worse. Want my standard recipe? Click here. Apple Cider Chicken: This is a healthy and easy meal to make. It's just a little bit fancier than plainer meals and is great, fast meal to make when you have less than an hour to prepare dinner. It's naturally gluten free, a little hardier while still being light, and is an interesting mix of sour and sweet with chicken. Butternut Squash Soup: Another personal recipe, while butternut squash soup is pretty common, it's nice to have one that is meant for a Crock pot and is gluten free! It's simple and only takes about 20 minutes of work for the prep. Sushi: this is my personal recipe that I've used for years, it is always a hit and has never turned out badly. It's easy to make gluten free (e.g., no panko, gluten-free soy sauce) and can be as expensive/cheap as you wish it to be. Although a little more prep, is totally worth it! I am a huge fan of Glutino: Gluten Free Pantry. My favorite bread to make is their box mix of Favorite Sandwich Bread. 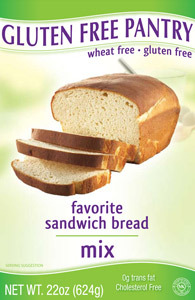 Most gluten free store bought breads are dry, hard, taste funny, taste like cement, etc. etc.. Okay, maybe I'm being harsh, but I don't care. I love this bread because it is easy to make, costs about the same as buying much smaller loafs, and tastes 10 times better.